Until now, what goes on behind the kitchen doors of your local curry house or pizzeria has been a well-kept secret. But plans are afoot in some parts of the country to put hygiene reports online. Standing on the pavement outside a restaurant, what sways the decision over whether to step inside? The look of the restaurant's interior, its popularity, the kind of food it serves play the biggest part, research has shown. Soon, cleanliness could also be a consideration with a new scheme set to make restaurant hygiene ratings public. In London, reports compiled by local hygiene inspectors will appear online and there will be a five-star award system, with certificates to be displayed on the restaurant wall. The pilot scheme, provisionally titled Scores on the Doors, is being co-ordinated by the Food Standards Agency, and will extend to Scotland and the East Midlands. Details of restaurants in the capital will go online from April next year. From the swishest eateries, through the High Street sandwich shop, down to the local takeaway, and even supermarkets, environmental health reports will be laid bare. Mice and all. It follows similar schemes in the US, Canada and New Zealand plus home-grown ones like Leicester's "SmileSafe" rating - another model being tested - where a smiley, or not-so-smiley, face is displayed in restaurants. For years, such hygiene reports were kept confidential from the public. The recent Freedom of Information Act has changed that - allowing anyone to access data held by public bodies. But a 20-day waiting time for results somewhat crushes the spontaneity of dashing out for a bite to eat. The FSA hopes that inter-restaurant peer pressure will prompt eateries to display their rating. And the theory runs that if environmental health data is made so public, it can only push it up the priority list. London restaurants will be given star ratings based on factors like food hygiene and handling practices, how good the management are and how structured, or ramshackle, the place is. It will take up to 18 months for all restaurants to be rated. Before heading out to eat, diners will be able to check their destination - by restaurant name, by area and, eventually, by cuisine type. If the restaurant has a bad day when the inspector comes calling, says, environmental health officer Rick Mason, involved in setting up the London scheme, that's just "tough". Restaurants will have two weeks to appeal any decision, however. For consumer watchdog Which?, the idea cannot come soon enough. Its research in March found 97% of people wanted this information to be made public. And it hopes the FSA will decide which scheme - online rating or on-the-wall certificates - works best, and back it, as soon as possible. "Consumers are in the dark," says Which? chief policy adviser Sue Davies. "People travel around the country so it's important there's a consistent national scheme." Choosing a restaurant is an increasingly important call. The restaurant and take-away bill is the fourth most popular destination for our money after housing, cars and food shopping for home. But how much can these websites and reports really tell the diner? Evidence from abroad, like the New York scheme, show a great deal. Ever wondered how that restaurant once visited in Manhattan fares? It is on the website. The site has "alerts" to highlight truly bad and "Golden Apples" for those with excellent standards. If nothing else, they are a fascinating read, and, for example, diners heading for the White Plains Road, in the Bronx, are advised to avoid some restaurants for their rife cockroaches and absent hand-washing facilities outside staff loos. But how much attention will people in Britain pay to this information? Even the FSA's research shows punters trust their own judgement. Surely we instinctively know if somewhere is dodgy? Environmental health officers say it should help customers avoid the worst cases they see... "particularly bad infestation of cockroaches, rats and mice. 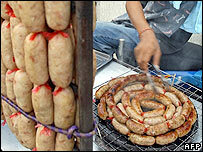 Extremely bad handling practices of raw and cooked meats". "Some businesses spend money on the front but don't worry too much about what goes on behind the scenes," says Mr Mason. Many restaurateurs welcome the idea but fear it may baffle would-be diners, scaring them off with too much detail. "It's probably a good thing," says Peter Harden, co-editor of Harden's guides to London and UK restaurants. "Knowing that the customers are going to get this information will move it up the priority scale, particularly for the chain restaurants." 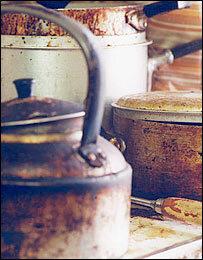 Worryingly, however, he says mice and cockroaches are a common kitchen staple - "especially in London, a vermin-infested rat-hole". Their presence may shock a naive diner, but it is how the restaurant deals with the problem that is crucial. If the online detail and the baffling stars on the wall are too much, he says, perhaps the traditional approach to gauging a restaurant is best, he suggests. "It's an old adage, and not perfect, but the states of the loos are a very good test. If they're not organised enough to keep the loos clean, it tells you all you need to know about their hygiene." I remember working in an upmarket place which prepared swanky boardroom lunches in the City many years ago. Our days always started by turning the lights on and hitting as many cockroaches as possible before they headed for cover. 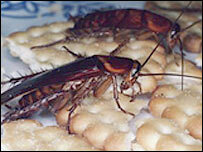 Infestations of insects and rodents where there is food are more common than people realise. I was made aware of the scores on the doors website a few weeks ago. I looked up my local (very popular and busy) Vietnamese takeaway - needless to say I won't be going there again. It scored zero stars for everything, with comments such as "No confidence in management" etc. Disgusting. I've been in many cafes and restaurants where the facilities were absolutely spotless and you could see that they were cleaned regularly. However, that is all somewhat spoiled when you then see a member of staff, in the middle of preparing food, sneezing and blowing their nose at the cookers and going straight back to preparing it without washing their hands. A great idea that should be extended to schools, hospitals and work canteens. We all pay for poor food hygiene via the NHS & should therefore have access to all the facts. The US version of the so-called food inspectors is riddled with incompetent unqualified hacks, with no real training, experience, standards except some other hack writing up military-style temperature requirements, use of cleansers and soap solution. The first criteria for hygiene inspectors should be proper educational background of at least a college degree in the particular scientific field and food preparation, followed by hands-on training. To spot infestation by roaches, mice and other vermin does not take a genius. Having worked with food as a waitress, barmaid and ferry stewardess I welcome these reports being free for all to see. I worked hard to make sure everything I did was perfectly hygienic and public praise for that would be nice! About time! At least customers can make informed choices & it will bring standards up. As a former head chef I can tell you first hand that some of the hotels and restaurants that I worked would not allow for cleaning in terms of both time and money. I was always forced to live on the edge with owners saying one thing when EHOs appeared and privately another thing. It really comes down to the owners of these places to budget, allow time for these things and not just chasing more profits at the expense of hygiene. Is Glasgow ahead of the game here? For some time we have been able to access reports on inspected premises in the city on the council's website. The information covers inspection of restaurants, food stores, care homes, and other places where food is sold or served. Surely any places with unsatisfactory standards of hygiene should just be closed down? I have no objection to results being online and public, but why allow them to operate if they are shoddy? I think it's a great idea to let people know whether their local pizzeria is up to standards. But would this not put a damper on businesses? You don't want to scare people off eating out, especially in places that are willing to improve themselves.